Sormenjälki (= Fingerprint) was one of the short-lived Finnish pulp magazines just after the war. It was started in 1949, but lived to see only two years. Here's one of the covers for 1949 - it's by the Finnish pulp stalwart, Ami Hauhio. Great action! 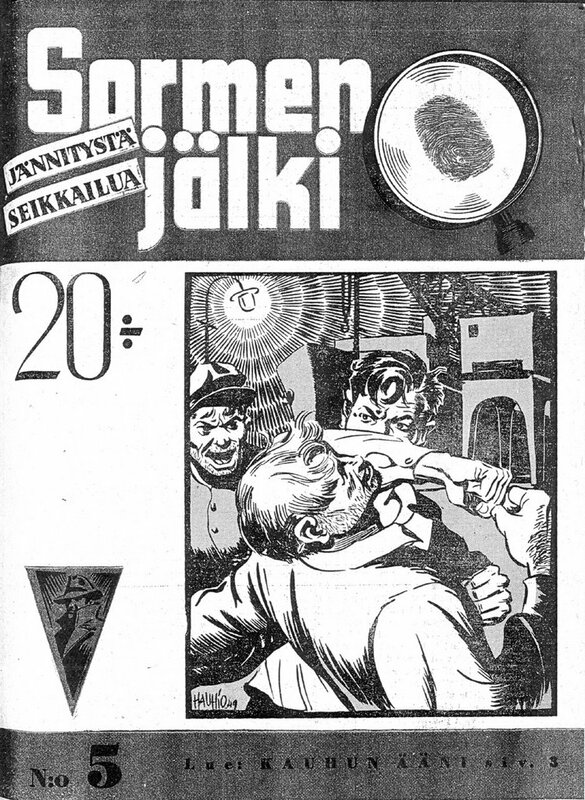 The magazine was at first edited by Selim Tapola, who also wrote adventure and crime yarns under his own name and also as Jori Tervanto. He did some juveniles, too. Later in 1949 the publisher himself wanted to cut expenses and started to edit the mag, which was a pity, since he clearly had no clue and no contacts with the writers. The stories were anonymous from this point on.